One or both parents (preferably both) need to make an appointment to meet with me (Sue Monahan) so we can discuss your child's needs and goals. Normally these meetings take about 30 minutes. I explain how the Kumon system works and what tasks both the child and parents need to commit to for the program to be successful. Kumon is a very effective after school training program with 4.3 million students in 49 countries worldwide currently. However it should not be entered into lightly. Both the parent(s) and child need to understand what it involves and be prepared to make a long term commitment to achieve maximum benefit. Click here for a 5 minute video description of Kumon. Next an application form needs to be completed for each child. When you arrive please fill it out carefully. 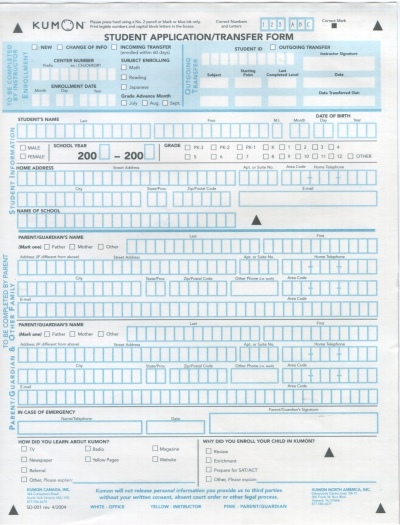 A Time Slot Form also needs to be filled out. This form indicates the preferred subject and times each week your child will attend the center. In order to place your child at the correct starting level within Kumon he or she will then take a short placement test in math and/or reading. This test typically takes 30 to 60 minutes to complete. From it I will determine the best starting level within the Kumon curriculum for your child will start at. Registration fee, $50 per student. Monthly Tuition, $130 per subject per month. A $10 discount is given for a second or third sibling. A payment option of paying via Electronic Funds Transfer (EFT) is available. Late Fee, $10 if payment is not received by the 7st of the month. Returned Check, $25 processing fee for each returned check. Parents and students wishing to learn more about our Kumon program should phone our center and setup an appointment to meet with me. Once a child is enrolled they visit one of our two centers twice a week. Each student comes at the time indicated on the Time Slot Form described above. Here they meet with front desk staff and turn in their completed homework and receive class work and the next homework to take home. They then go to meet their assigned table center assistant to complete corrections on their returned homework and class work. Class work mistakes need to be corrected before they go home. Typical students take about 20-30 minutes per subject. Here are some questions that are frequently asked by parents who are interested in Kumon. Q: What is different about Kumon from other tutoring programs? A: The Kumon method and materials are unique. Kumon has designed its own curriculum which students can self-learn easily. They advance through the program at their own pace, completing a small amount of work every day. Kumon also is affordable which allows more students to benefit from it. Q: How long will it take for my child to attain his or her appropriate grade level? A: That depends on your child. 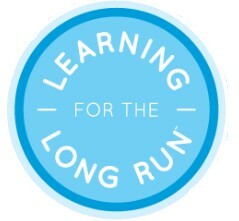 Kumon is a long-term program, not a quick fix. Our goal is not just to get your child to pass the next test at school. Our goal is to pinpoint where the underlying weak areas are for your child, and to go back and start from that point. That way we can re-build a strong foundation, which is the key to success for a child's lifetime. It takes most students that are behind approximately six months to one year to catch up to Kumon grade level, and then work ahead to an advanced level. Q: How do you teach the students? A: Our curriculum consists of thousands of worksheets, arranged in very small steps, starting from very simple pre-school work all the way to high school and university level work. Each step, or worksheet, builds very gradually from the next, and each time a new concept is introduced, examples and explanations are given. By starting at a comfortable point, and moving ahead only when they are ready, students can move through much of the work independently. I strictly implement the Kumon method at my center. We grade student's homework and class work, monitor and analyze each student's performance and progress, and make appropriate lesson plans for each student. When students need help, We are always here to guide them through and answer any questions. Q: How do you expect my child to do Kumon every day? A: Kumon homework only takes 15-30 minutes every day. The Kumon work is deliberately easy at the beginning. We give the student homework that we know he or she can do. Completing the daily assignments quickly and with a good score will boost the student's confidence, and make him or her see Kumon as a positive rather than a negative experience. Q: My son hates math. How can you help him? A: His negative attitude is probably the result of a bad experience that damaged his self-confidence in math. When he has to do math, his negative feelings and lack of confidence prevent him from doing as well as he could. Kumon will help by taking him back to a point where he can experience success and by showing him all of the things he can do in math. This will relieve his frustration, improve his self-confidence, and give him a foundation to build better skills also. A: Most students show improvements after attending Kumon, both academically and in areas such as confidence and study skills. If students complete their daily assignments, attend class regularly, and follow our study plan, they will show improvement within approximately one to three months. Q: What kind of test will you give my child before starting Kumon? A: Kumon has developed its own tests for students that enroll in its program. Their primary purpose is to show us where students will be more comfortable starting in the program. The math tests concentrates on assessing speed and accuracy with basic calculation skills, because s strong foundation in this area is crucial for success with all higher math. The reading test concentrates on assessing basic reading, reading comprehension, and writing skills for the same reasons. Q: My daughter is on the swim team, takes dance lessons, and gets tons of homework. I'm not sure if she can fit this into her schedule. A: Kumon recommends that your child comes to the Center twice a week for about 20 minutes per subject. Homework must be completed on the five days that students do not attend class, and will take around 15-20 minutes per subject. Many students find it easiest to do it first thing in the morning, or before their regular homework. What is crucial is that it is done daily, so it is important that you are able to commit to this schedule - if not you will not see the results. Academic success at least is equally important as other subjects. Math and Reading are the fundamental skills for other academic fields. Kumon believes "Practice Makes Perfect". Like swimming and dancing, Math and Reading need practice too. Q: My daughter is in high school and wouldn't be comfortable working around younger children. Do you have separate time for older students? A: We want all of our students to be comfortable in the Center. There is usually a mix of ages and grades in the Center at any time. Younger children have their own area. Q: We live far away. Can we come just once a week? A: It is preferable that you come twice a week, for several reasons. First of all, every time students come to class, I can observe their work and give them whatever help they need therefore the more often they can come the better it is for them. Additionally, the more often they come to class, the more frequently I can review their homework. This means that I will see right away if they need to review a section , or if they are ready to move ahead. If you can only come to the center once a week, we can discuss more in details for home grading. Q: My children are already getting good grades. Won't they be bored with the low starting point you are suggesting?